We offer Allflex and Destron Fearing ear tags as well as EID readers, Allflex syringes, and a wide variety of accessories. Custom Cattle Tags provides cattle producers the opportunity to purchase high quality visual ear tags at an affordable cost. Visual tags are the foundation of most identification programs. Check out the Allflex A tags (one piece tag) or Destron Fearing two piece tags in a variety of sizes and colors. Additionally 840 tags, visual, RFID and ChoiceSet can be purchased by producers who have a Premises ID. You have options…Customize the Destron Fearing two piece tag to fit your breeding program by adding text lines (front and back), logos (front and back), or customized management numbers on each tag. Our interactive web-site features easy to follow, step by step instructions and provides a preview or mock-up of your tag proof. See a rendition of your logo, text and management numbers before placing your order. Destron Fearing tags feature Dark and Durable for the management number. Customized text lines and logos are laser-engraved and will appear dark gray in color. Logos and artwork will require an extra 5 business days processing time. All other orders require 10 business days to process, plus UPS ground shipping time to your location. If you have questions please call 816-383-5100, weekdays 8am-4:30pm CT.
Returns are not accepted on custom tag orders. Merchandise that is not customized can be returned, but will incur a 15% restocking fee. Please call for more information when returning items. Important: Do not build custom tags one at a time on this site. If you are purchasing non-sequential numbers please read these instructions or call the office. Allflex A tags cannot be customized. These tags are sold in groups of 25, pre-printed with the management numbers or you can choose blank tags. Processing currently takes 10 business days plus UPS ground shipping time to your locaiton. You can choose overnight shipping for an additional cost, however processing time is still 10 business days. 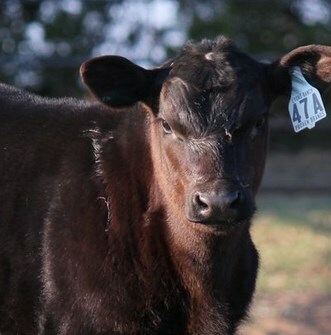 Want to add value to your Angus-sired commercial feeder calves or replacement females? Consider enrolling your calves in AngusSource®. This marketing program uses a tamper evident ear tag to designate enrollment. Visit www.angussource.com for more information.